You have always wanted a sizeable bag that can fit all the makeup tools, cosmetic products, briefs and papers that you have to carry around all day long. At the same time, you donâ€™t want to give up the idea of being trendy and it seems to you that a huge bag would take always some of the style you have been displaying so far. Well, now you have the answer. The iconic Italian fashion house has thought precisely at you when conceiving this elegant, yet very practical bag. 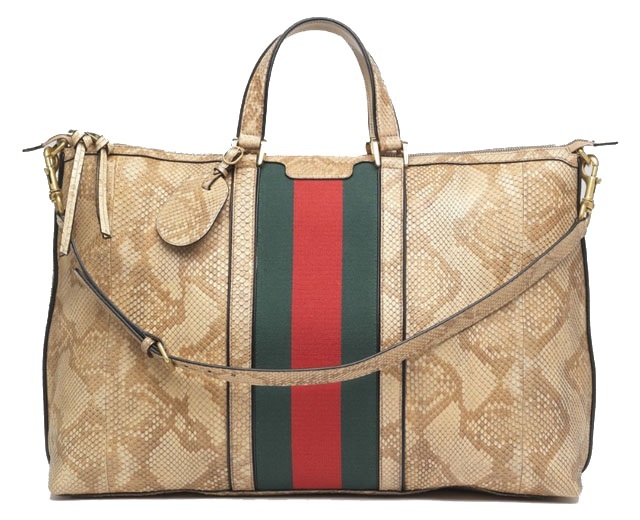 With Gucci Natural Python Duffel Bag you will never feel like you are missing something as you will have everything with you: your spare pair of glasses, your hand cream, your favorite perfume, your agenda, your laptopâ€¦ they all fit inside this sizeable companion that seems to have been created just to make your life easier. Moreover, the elegance you have been aiming for is never lost. Not when you are wearing a python leather bag with distinctive signs that it was conceived by some of the greatest designers in the world.